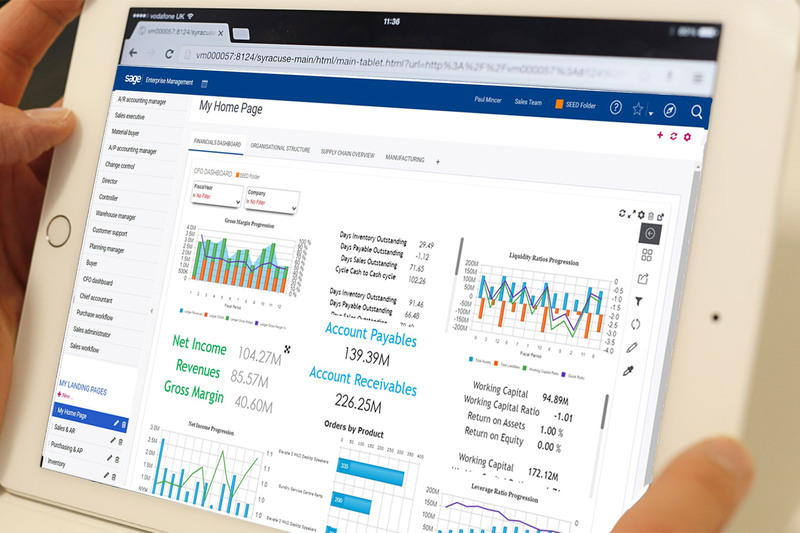 Is Your Investment in ERP Being Managed to its Full Potential? Keeping control over system activity can be an onerous task. You've invested a large sum in a new ERP and need to be sure that it's providing the desired business outcomes, across multiple departments, locations or even companies, but it's hard to keep an eye on all of those spinning plates, isn't it? One aspect of this might be performance related - regular reporting is one way of checking that targets are being met, budgets aren't being overspent and that demand spikes are being suitably managed. With Sage Enterprise Management, you can make the results you need available to you as soon as you log into the system. Standard Enquiries and Requesters provide real time information in a tabular and/or graphical format, which can all be exported if required. Alternatively you can embed an external URL, which opens up the possibility of bringing reports, charts and dashboards from a BI tool such as Sage Enterprise Intelligence (SEI) into your Enterprise Management system. SEI also allows you to distribute information by email on a scheduled basis, so, wherever you are, you can get daily, weekly and/ or monthly updates on the metrics that matter to you. If that all sounds too much like "Information Overload", however, you could think more about information by exception. Would you prefer to only be told when something significant happens, or is about to happen? Sage Enterprise Management contains a Workflow engine which enables email notifications to be sent based on trigger events in the system. Maybe you want to be informed whenever a new customer has been set up but the credit checks are outstanding. Maybe you want to be alerted when suppliers are being added, but afterwards only when their bank account details change, so that you can check these before the next payment run. Or maybe you want to know that the stationery spend for your department has just hit 80% of its budget for the year. Once certain fields are updated, records added or even database calculations completed, then these can act as triggers for an email. Another, more commonly adopted use of Workflow functionality relates to approvals (or rejections) of documents such as Purchase Requisitions/ Orders and Sales Quotes/ Orders. 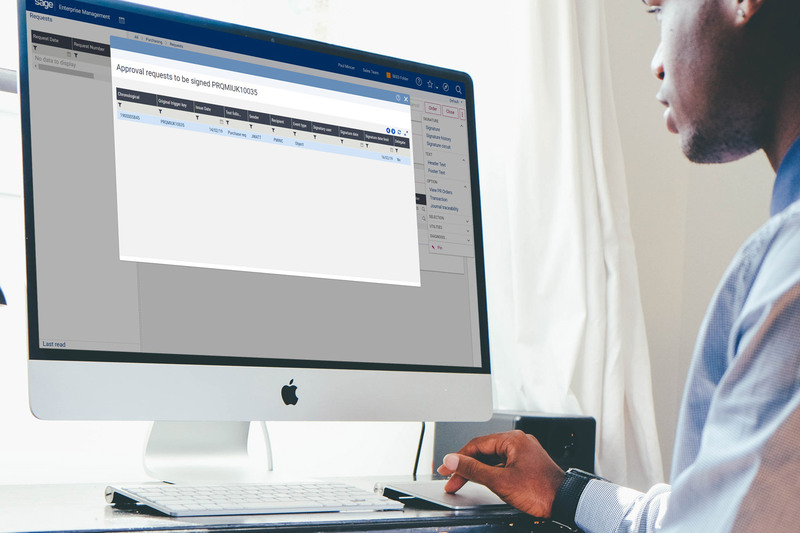 We discussed Purchasing approvals generally in a recent blog, but a Workflow Monitor allows you to keep track of outstanding documents requiring your signature - these can be monitored and actioned either within the system (at desk or on the road) or via email, so there are plenty of options available to ensure that important, high value orders, for instance, don't slip through undetected. To make sure you don't miss anything, you can also view all changes to specified fields and screens through Audit enquiries. These can then form the basis for a report or enquiry to be printed, emailed or simply displayed on screen as part of a Home page for quick and easy access. You could, for example, generate an enquiry showing the history of changes to a customer account over a period of time, with person and date stamps against every change. Financial transactions can easily be traced back to their source documents from any enquiry, whether you're looking at a single Account for one company or a consolidation across multiple entities. This means that you can take costs in your P&L and trace it back to the source documents such as Purchase Requisitions. Overall, whichever combination of the above controls you decide to implement, these can be delegated, so that responsibilities can be shared at different levels of the organisational structure. So, rather than doing lots of running around in order to keep those plates spinning, maybe a better idea would be to get other people to do some of your spinning for you, leave the well-spinning plates to keep spinning themselves for a while and focus on the ones that really need attention.